Malai mutter Paneer goes best with Naan, chapatti, or Pulao. Grind the onions into fine paste with poppy seeds, cumin seeds and ginger, garlic. Now, pour the onion mixture and cook until it turns to thick gravy for about 10 to 12 minutes. Add salt and red chili powder. Now add the peas to it and cover the pan and cook for another 4 minutes. Add the fresh cream to the above mixture and cook for 10 minutes. 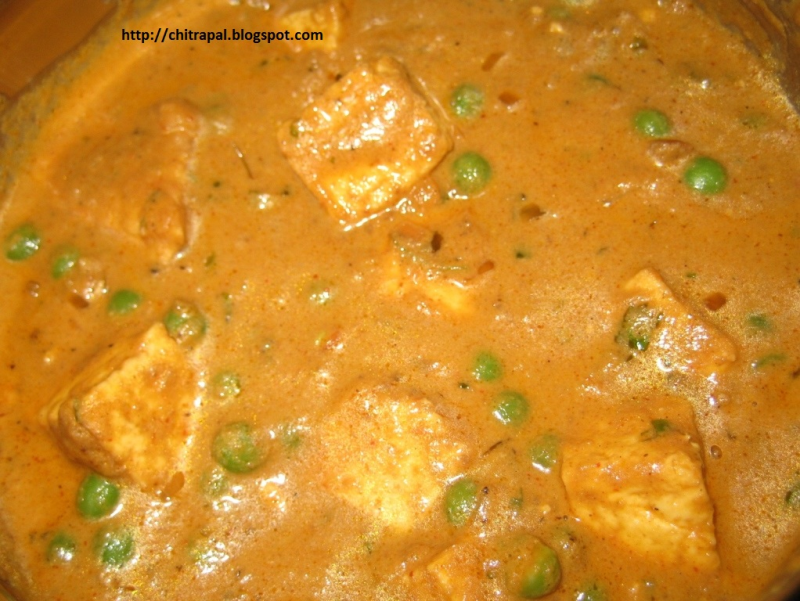 Turn the heat to very low heat and add paneer cubes cook for 5 minutes. Now add the cashew nuts. Stir well and cook without heat. Turn off the gas. Garnish with fresh coriander / dhaniya and serve with naan or pulao. Hi Chitra...i tried this out for my last week potluck & it was very tasty. Everyone like it. Good work! Hi Rupa, It is Garam Masala powder actually...I missed "Garam" word :) in the recipe..sorry. enjoy.. This reminds me of traditional indian marriage.......shaadi ka khana.........great work, keep it up. By your method everyone on here should have all their recipes in the most popular list. Thanks Surangama, Your appreciation keeps me going. Chitraji you post excellent recipes, thanks a lot, keep up the good work! Seems to be tasty treat, will try. Sorry forgot to mention Kasuri Methi add 1 tbsp of Kasuri Methi with Salt and Red chili powder in step 4.